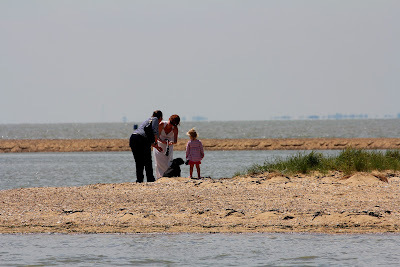 Beauty and the beast: the problems for the Little Tern. 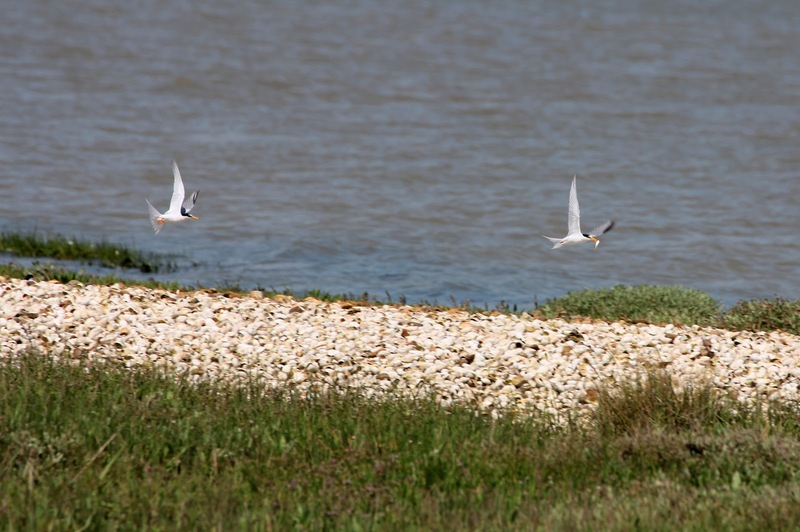 The two-day tour of the Essex coast was primarily to look at the fortunes of the Little Tern. By the time we had finished, and understood the problems, we were all a little sterner. Little Terns have not been doing well recently; in Essex or further afield in the south-east. 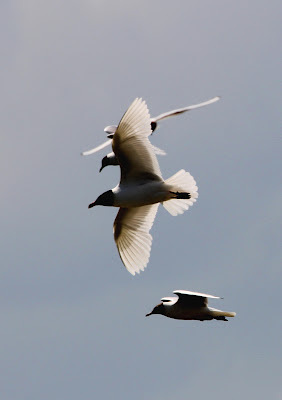 They suffer from disturbance by humans, competition from gulls and flooding from high tides. And everything seems to like to eat them; from Foxes, Stoats and Hedgehogs, to Kestrels and owls. Much of this comes down to an increasing lack of safe nesting sites on our over-crowded coastlines. 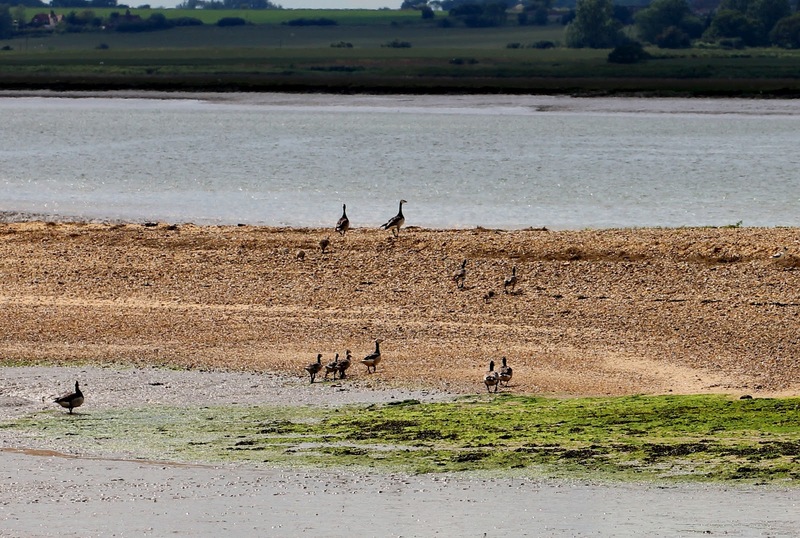 Whilst the beaches clearly have disturbance issues, the Essex coast has many small saltmarsh islands amongst its estuaries and creeks. 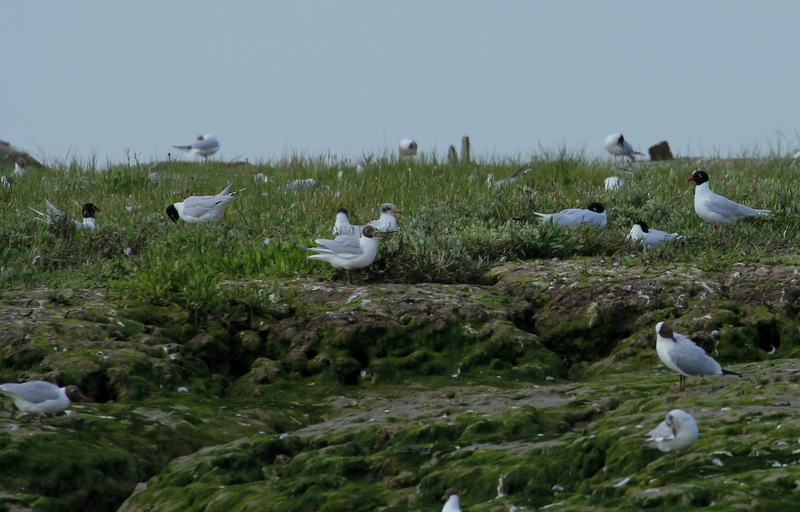 We found 3,500+ pairs of Black-headed Gull, 100+ pairs of Herring Gull, 56 pairs of Common Tern, 30+ pairs of Oystercatcher and 8 pairs of Ringed Plover. 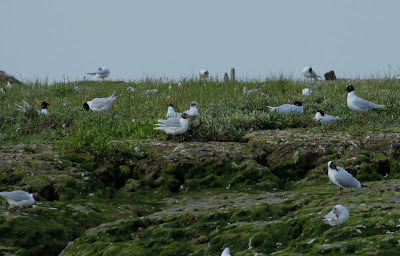 More surprisingly, a total of 29 Mediterranean Gulls were noted, including at least 6 on nests. Little Terns amounted to 41 nesting pairs, with 20 or so additional birds. The islands perhaps provide an answer for the Little Terns. Many of the nesting pairs are on areas of dumped dredging or shellfish remains. 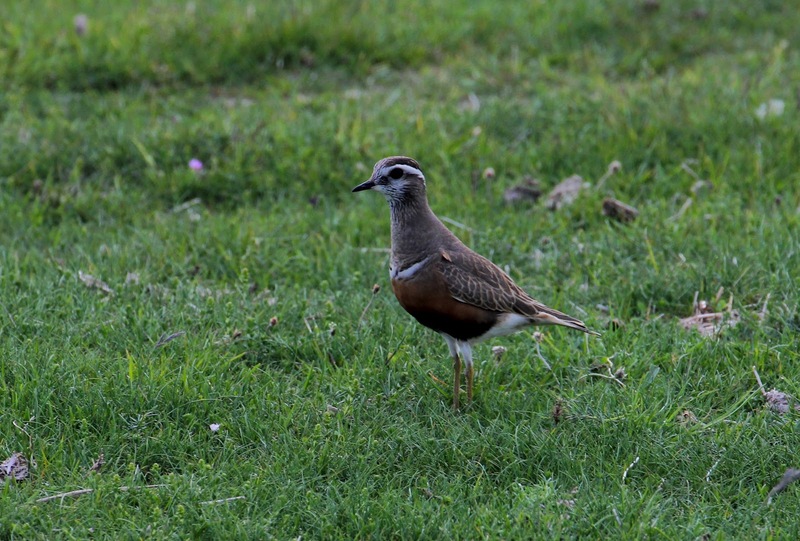 The saltmarsh islands are not attractive nor very accessible to people or ground predators. A partnership with harbourmasters and fishery interests might bring about the regular recharging of small areas of suitable nesting habitat for the terns. Elsewhere in East Anglia, news is of mixed fortunes for Little Terns, with the usual problems of flooding out and predation. However, up to 200 pairs near Winterton is excellent and North Norfolk may still have 400 active nests. A spell of calm weather might be helpful! 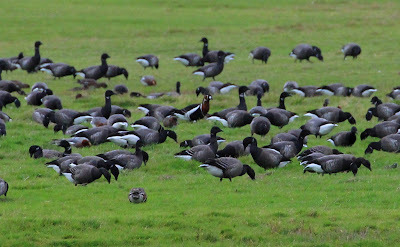 Geese in Essex - Red-breasted last winter and broods of Barnacles yesterday. Just to remind you, here’s a photo of a Red-breasted Goose in Essex from last winter. I saw it again yesterday, or did I? I certainly saw a Red-breasted Goose; holding territory on an Essex coastal marsh, with a female tucked away on a nest. Last year this pair raised four young. I was visiting an area of coastal marshland at the invitation of the landowner during a two-day tour of sites on the Essex coast. The landowner is a farmer who ‘likes his birds’. 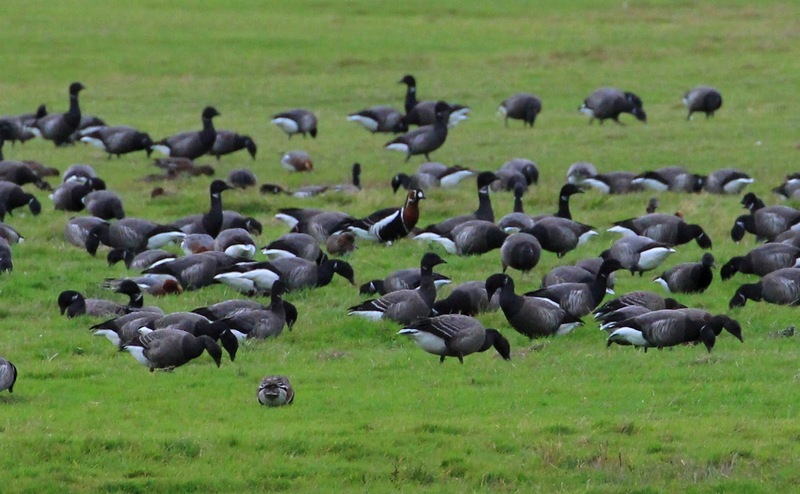 The most obvious thing about this well-managed land was that it was teeming with young birds; waders, geese and duck. There were around 70 pairs of Avocets (many with well-grown young), 5 pair of Ringed Plover, 20 pairs of Little Terns, 1,000 pairs of Black-headed Gulls and many Redshank. I saw broods of Gadwall, Tufted Duck and Shoveler. 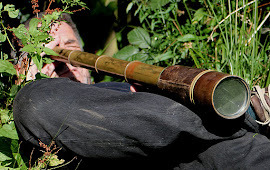 The landowner operates a minimal disturbance policy and ‘discourages’ ground predators such as Foxes and Stoats. There were also many geese, including about 80 pairs of Barnacles and the pair of Red-breasted. 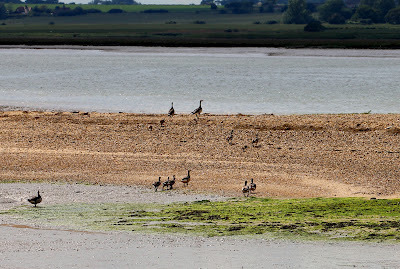 I saw around 20 broods of Barnacle Geese. A fascinating site, but somewhat alarming if you want to think the Red-breasted Goose you are chasing is wild. Choughs, The Oa and a fat, juicy tipulid larva. A welcome change of scenery last week looking at reserve issues on Islay, with The Oa and Loch Gruinart being the main sites visited. An Otter in the bay below the campsite at Port Charlotte was a good start. 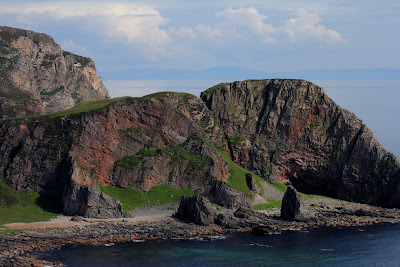 Management for Chough was one focus of the visit. They prefer places with short, grazed pasture, less than 5 cm in height, and soft soils where they can probe to find food. A specialist feeder on invertebrates, they will take beetles and their larvae, fly larvae (especially tipulid (Cranefly) larvae), ants, their grubs and pupae, and spiders. 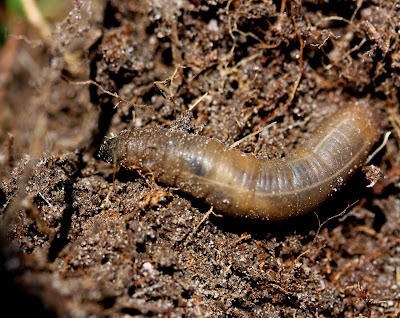 Dung invertebrates are an important source of food. Such food resources can be patchily distributed, as we found by sampling various areas of turf but we did turn up some particularly juicy tipulids in a key feeding area. Marsh Fritillary butterflies are locally frequent on Islay. Attack by parasitoid wasps appears to have an important effect on the population dynamics of the butterfly and may help to explain its requirement for large habitat patches. Two parasitiod wasp species, Cotesia bignellii and C. melitaearum, are present in the UK and are of conservation importance in their own right, one being specific to the Marsh Fritillary. Studies suggest that the parasitoid and its host may have a shifting metapopulation distribution, with the butterfly 'escaping' parasitism in some areas by dispersal and colonisation, with local extinctions occurring in other areas. 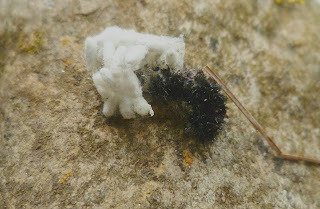 A Marsh Frit caterpillar with cocoons of emerged parasitiod wasp larvae. Highlights of the trip included 30+ Chough, 6 crekking Corncrakes, 4 Golden Eagles, Hen Harrier, Tystie and Great Northern Diver. Loch Grunart produced Corncrake and Quail calling together in front of a pair of Whooper Swans. As well as an approachable flock of 20+ Chough, Ardnave Point also produced a typically tame migrant Dotterel. And all this sandwiched between a daily menu of various local delicacies; from full Scottish breakfast with ‘square’ sausage and tattie scone through to sampling the local whiskies. 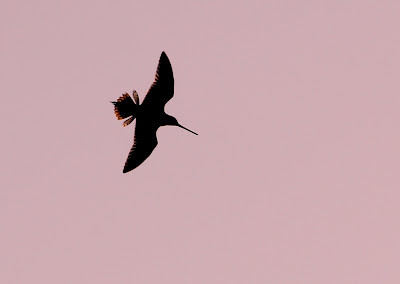 On balance, this spring is not shaping up to be a great one for the 50 or so pairs of breeding Black-tailed Godwits in the UK, with their primary locations on the Nene and Ouse Washes both flooded out by the heavy April rains...but every cloud has a silver lining so they say. I visited the Nene this week; floodwaters are receding and although both Godwits and Snipe were busy displaying overhead, surely time is running out for the Godwits to produce many young this year. There is an increasing urgency to attract them to new sites, either existing or created, that do not function as storage washlands for summer downpours. So what do they require? Godwits favour large, open wet grasslands and marshland. A Dutch meadow-bird conference I attended some years back explained their dislike of ‘up-going structures’ as the Dutch liked to call them, and this included trees, hedges, buildings and the like. They like to see in all directions. 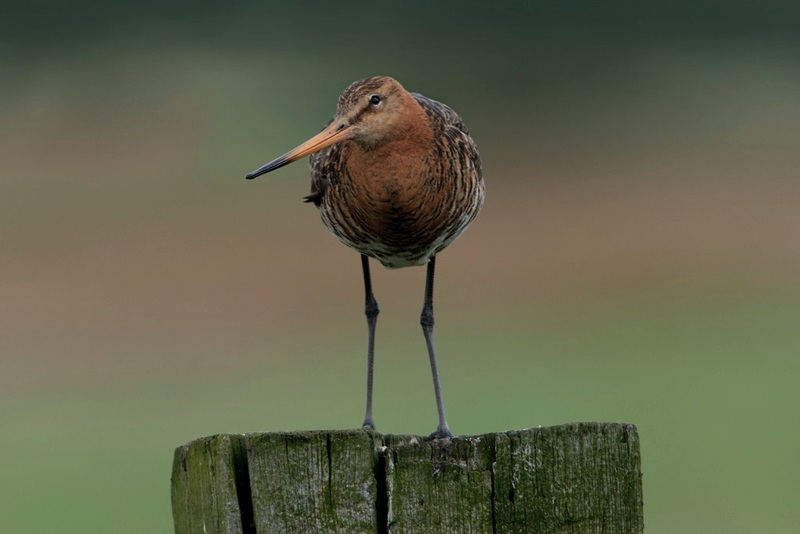 After arrival on the breeding grounds, adult godwits require grasslands rich in soil invertebrates, probing for earthworms where high water tables push them close to the surface. 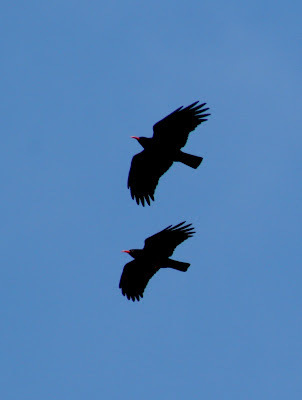 They also seek out shallow pools as safe roosting sites. The chicks have different requirements. They seem to require longish (20cm) grass, often flower-rich but always with an abundance of invertebrates, particularly flies and beetles, amongst the vegetation. The density of the vegetation is important, with sparser swards preferred for the chicks to forage amongst. A particular problem appears to be their attachment to natal locations and their slow colonisation of new sites. So both the RSPB and WWT have been busy creating new habitat on ex-arable farmland adjacent to, but outside, the Ouse Washes to try and attract breeding Godwits. 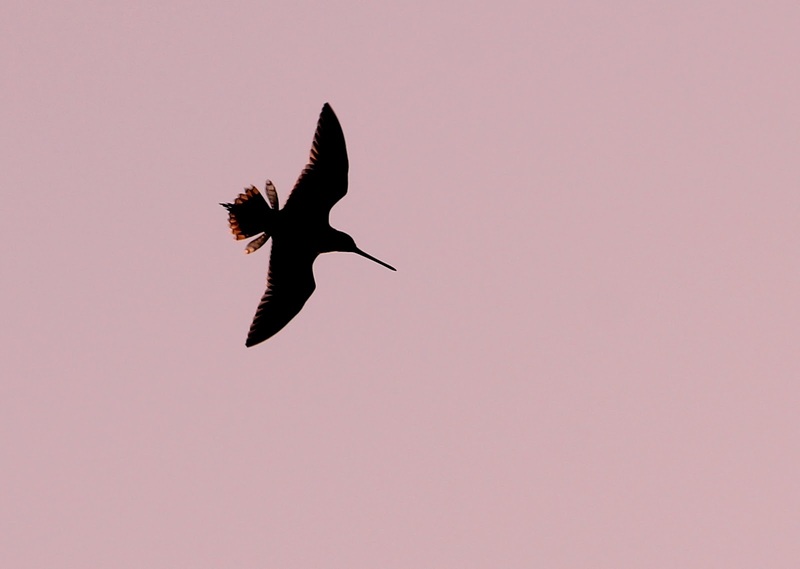 After some years of ‘maturing’ habitat, an excited text from the site manager over the weekend brought the news that the first Black-tailed Godwit chicks had hatched on the new RSPB land. Somewhat ironically, the heavy rain and resultant flood has pushed the few remaining Ouse Washes Godwits onto both the RSPB and WWT new habitat. Let’s hope they stay there.